Spike TV has turned one of Jimmy Fallon‘s best bits into its own show with Lip Sync Battle. Hosted by LL Cool J, the object of the game is to out lip-sync your opponent, with as much accuracy and excitement as you can. My personal favorite of all time, back on Late Night With Jimmy Fallon, was when Joseph Gordon Levitt did “Superbass” by Nicky Minaj. That was magic. And this new Spike show recreates this magic. 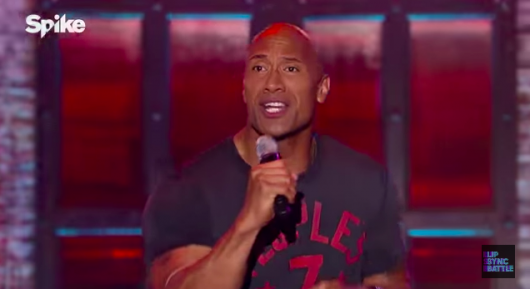 Because who doesn’t want to see Dwayne Johnson lip-sync to Taylor Swift’s “Shake It Off”? I think Fallon ended up ahead with this one as he “jumped in the line” in the audience and formed a conga line. Their last battle was Fallon doing “Like a Prayer” by Madonna vs. Johnson’s “Staying Alive” by The Bee Gees. You gotta watch. Fallon has an entourage. But the Rock puts on the white suit has got some moves. I think this one was a draw. Also check out the two battle videos between Common and John Legend. This show is so much fun!